Sunrise on a cloudy morning, originally uploaded by Roland Bircher. 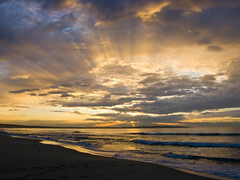 This is one of my favourite photos of my recent early morning trip to Cronulla beach I have described a few days ago. I like the version with ratio 2:3 even better, but I tend to fill my flickr page with photos in the original (digicam) proportions. This entry was posted on May 22, 2008 at 2:54 pm and is filed under Nature, Photography. You can follow any responses to this entry through the RSS 2.0 feed. You can leave a response, or trackback from your own site. I just saw the bigger version. It’s just breath-taking.